Dozens of monkeys raided the Tsz Wan Kok Temple for visitors’ food offerings to their ancestors during the Ching Ming Festival on Tuesday. 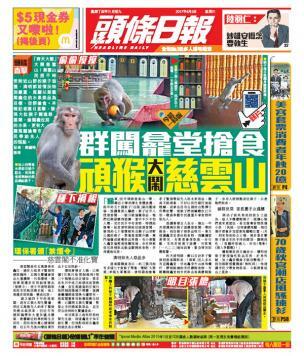 Over 70 monkeys, believed to have come from the neighboring Lion Rock Country Park, were spotted hovering around the Chinese temple in Tsz Wan Shan, Headline Daily reports. The monkeys were looking for fruits and other offerings such as Cha Siu rice on the tables, rummaging through the trash and making a mess of the place. Residents said the monkeys started stealing fruits from the temple six years ago, but lately they have become more brazen in their behavior. Many of the primates were openly snatching fruits from the visitors. Some parents said they had to be more alert because the monkeys could be carrying diseases and could harm their children with their sharp claws. A man surnamed Cheung said he was worried for his one-year-old son, and was thinking of relocating his parents’ urns to another columbarium. Temple staff said they used to strike bamboo sticks on the floor to scare the monkeys away, but the trick no longer worked as the monkeys realized they were under no threat. Now they could only urge worshippers to take care of their belongings and food items. The Church of Christ in China Kei Tsz Primary School, which is facing the temple, has also been troubled by the monkeys, Sing Tao Daily reported. A woman surnamed Tong said a monkey grabbed her bag of bread from behind while she was waiting for her daughter who was attending classes in the primary school six months ago. The school’s vice principal said a drill is conducted regularly on the campus to prepare students and teachers in case of monkey invasions. The exercise teaches the children to remain calm and avoid direct eye contact with the monkeys in order not to provoke them. They should also refrain from giving them any food. A spokesperson for the Agriculture, Fisheries and Conservation Department said it received two complaints about the monkeys in the district in the past year. Since the monkeys are attracted by the food left behind by worshippers in the temple, the department advised temple staff to stow away the food after the worship service. Monkey expert Hui Man-hon said monkeys steal food from the temple because it is an easy option. Temple staff should stop leaving food around in order to force the monkeys to go back to the hills, Hui said. They should have more respect for the sanctity of the temple...Monkeys is very funny! that is pretty normal since there is a monkey mountain near Hong Kong. residents need to be more careful when seeing them.